The Prophet Isaiah was the son of Amoz. The Hebrew name signifies Salvation of Jahu. He prophesied concerning Judah and Jerusalem in the days of Uzziah, Jotham, Ahaz, and Hezekiah--kings of Judah. He was married and had two sons. Tradition says that Isaiah, when ninety years old, was sawn asunder in the trunk of a carob tree by order of King Manasseh. These pictures of the Prophet Isaiah were taken from several old Bible books. 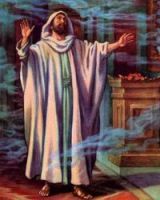 You're welcomed to use these Prophet Isaiah illustrations in your art projects. Click on the Prophet Isaiah drawings below to see more details about saving a free image or about purchasing the images of Isaiah the Prophet at a higher resolution.